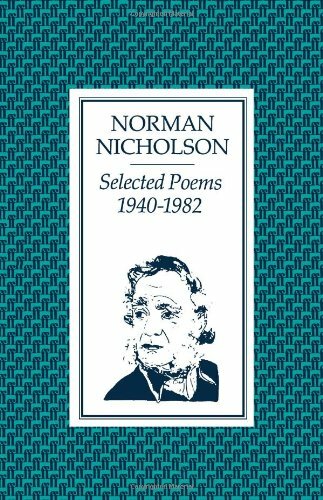 Norman Nicholson (1914-1987) and his poetry are inextricably bound up with the former iron-mining town of Millom, on the edge of the Lake District in Cumbria. Apart from several years spent in a TB sanatorium as a teenager, Nicholson never left the town, living in the same Victorian house he was born in, 14 St. George's Terrace. His life was largely uneventful: having survived TB, he converted to Christianity at the age of 22 which proved a major influence on his writing. He married Yvonne Gardener in 1956: the couple are buried next to each other in the local churchyard of St. George's. It is this very rootedness, however, that is the strength of Nicholson's poetry. His intimate knowledge of the town and its people and of the surrounding landscape gives his poems their subject matter and force. Like a painter returning over and over to the same view, Nicholson never tired of observing the world around him. Nor was this the world of a sleepy backwater: Millom may be remote from the centres of literary production in the UK but the rise and decline of its iron mines is the story, in microcosm, of the country's industrial malaise in the latter half of the 20th century. From its origins as a few scattered villages, Millom grew to be a prosperous town of 10,000 people after the discovery of iron ore in 1855. Nicholson was born at a time when the industry that employed most of the town was still booming. He knew the hard lives of the workers and the dangers they faced: his own uncle was killed in a mining accident. And he saw what happened when the industry failed, when the dole queue snaked half way down the street. He spoke about these lives in poetry that was simple, direct, colloquial and earthy. Like his Cumbrian forbear, Wordsworth, he believed in poems written in the language of a man "talking to men", frequently making use of dialogue and vernacular words in his work. These social upheavals were played out against the backdrop of the fells. Their massive and enduring presence, particularly that of Black Coombe which looms over the town, can be felt in many of his poems which often explore the relationship between man and landscape, between the beauty of nature and industrial waste. The titles of his books suggest his abiding concerns as a poet throughout his writing life: Five Rivers (1944), Rock Face (1948, The Shadow of Black Combe (1978) and Sea to the West (1984). Nicholson also wrote two novels, four verse plays, criticism and an autobiography, Wednesday Early Closing (1975), but it was for his poetry that he received most acclaim, including in 1977 The Queen's Gold Medal for Poetry. He was made an OBE in 1981 and was the subject of a South Bank Show in 1984. By the time of his death Nicholson's life of quiet witness had achieved what Auden described as "the poet's hope", to be, like a valley cheese, local but prized elsewhere. His Archive poem is a fine testament to his strengths as a poet: 'Wall' is a wonderful evocation of man's intimate interaction with the fell landscape. Stone and rock were materials Nicholson returned to again and again. Here the sense of words being placed carefully by the poet as the rocks are by the farmer is implicit in the poem, its use of monosyllables giving it the solid quality of the wall it describes. Nicholson's voice has an appropriately gravely edge to it which complements the poem's strong music. Though he wrote largely outside of the main poetic movements of his time, he is recognised, like Charles Causley, for his independence and authenticity, and his skill in capturing "the texture and pieties of a whole way of life" (Seamus Heaney).